A pioneer who pushed through federal and state legislation ensuring that breast reconstruction after a mastectomy would be paid for by insurance companies, Dr. Horner lost her own mother to breast cancer. She decided then that her mother's death would not be in vain. Using the metaphor of the Warrior Goddess, this book explains what Ayurveda, an ancient system of healing, describes as our "inner healing intelligence". It also explores the various foods and supplements that enable women to prevent and successfully fight breast cancer, as they claim the healthy body that should be theirs. Dr. Horner has added research from more than 500 studies to the updated third edition of her award-winning book, as well as information on risk and the BRCA1 gene mutation (the genetic condition Angelina Jolie was found to have), and a new chapter on "The Spiritual Journey of Breast Cancer". In it, she describes why cancer is a wakeup call, a time-out in which women can turn inward to evaluate their lives with the intent to restore good health and learn how to receive, trust, and surrender as they cultivate their relationship with their intuition and a higher power. 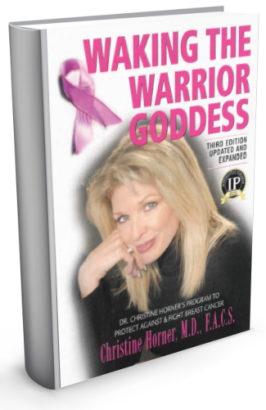 The final part of Waking the Warrior Goddess presents Dr. Horner's Thirty-step Program for reclaiming health and defeating breast cancer. In addition, this book includes an extensive, newly updated resources section for obtaining the particular nutrients and products that our bodies need to become and stay strong and healthy.